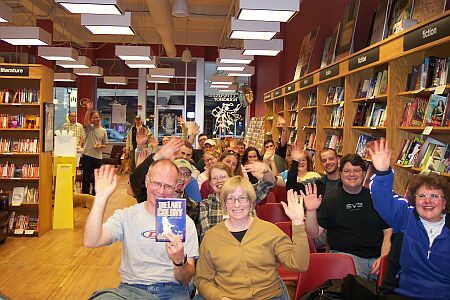 I was pleased to discover that some contingent of the audience for the Milwaukee reading actually hailed from Chicago; people actually trekked to hear me blather on. That’s heartwarming indeed. Also included: My friends Sarah and Allen Monette and Karen Meisner who also trekked, albeit from the somewhat less distant Madison environs. You all make me feel pretty. Thank you. Next up: Minneapolis — in just a few hours, in fact, since my appearance there is at 1pm at Uncle Hugo’s bookstore. You must excuse me, I have to pack and leave now. See some of you soon.